Wow, fantastic, wonderful, classy and true to its history; that’s what you’ll find here at 1410 Dollar Ave. Built in 1939 this home is significant by virtue of the fact that the current owner has done a stand up job of updating the property without harming the characteristics that make the home special, its red brick exterior, its cracked tile front porch, its interior arches and oak floors. The kitchen with stainless appliances and granite counter tops is a cook’s delight. Additionally there are custom built cabinets which afford an abundance of storage space. There is a gas range and there is a built in microwave. Adjoining the kitchen is a light filled breakfast room which is directly next to a formal dining room which would easily seat ten. The formal living room is spacious with a gas log fireplace as its focal point and heavy molding which lend a feeling of refinement and finish. At the back of the home is a comfortable family room with a second fireplace and huge windows in which one can step out onto an enchanted rear garden space. There is a rear patio which is constructed to be more like an outdoor living room, nestled between two detached one car garages. The main level of 1410 Dollar Avenue also has two bedrooms, one en suite and one additional full bath. The ceramic tile in each bath is true to the period in which it was installed but each bath has been updated and modernized. The master suite is on the second floor and consists of a huge bath with custom shower, two sinks, and an enormous walk in closet and skylights which flood the stairwell leading up with natural light. The bedroom is nicely sized and well proportioned. Additionally there is a tremendous amount of storage space in easily accessible attic space. 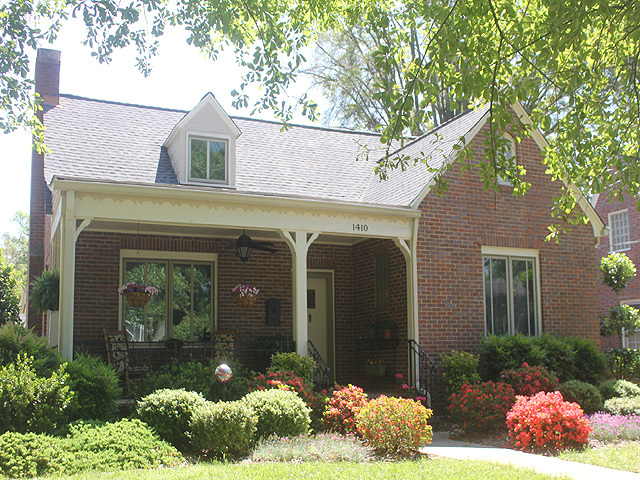 1410 Dollar Avenue sits in the heart of Durham North Carolina’s Trinity Park. The home has updated heating and air conditioning (2 systems), updated electrical service, a brand new roof, new bathroom fixtures, new windows and a new kitchen. Additionally a one year H.S.A Warranty is offered for buyer peace of mind.